The Bag Boy Company unveiled their one of a kind Nitron™ Push Cart, with its revolutionary auto-open technology, making it the fastest opening and closing cart in the industry. Its ease of use is unprecedented while maintaining its compact size for storage and transport. Golf Digest ranked Bag Boy’s new Nitron™ Push Cart at number 5 on their list of tech-forward products at the PGA Merchandise Show, highlighting the cart’s nitrogen-powered opening system which allows it to spring open from a folded position instantaneously and hassle-free. Eliminating the time it takes to open and the nuisance that often comes along with other carts is one of the top reasons the Nitron™ is so groundbreaking. 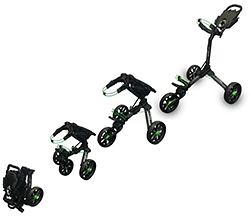 The Nitron™ Push Cart will be available April 25th in 8 different color options. The suggested retail price is $229.95 and will be available at multiple retail locations and at www.bagboy.com. Founded in 1946, the Bag Boy Company has built a reputation for unmatched quality, unbelievable durability and unsurpassed innovation and design. Bag Boy designs, manufactures and distributes a full line of award-winning, feature-loaded golf bags, push carts, travel covers and accessories designed for a golfer's on-course convenience and comfort. For more information, please visit www.bagboy.com. Follow us at www.facebook.com/bagboygolf, twitter.com/BagBoyCompany and www.linkedin.com/showcase/bag-boy-company/. Established in 2004, Dynamic Brands is the parent company for a portfolio of premium brand name companies committed to the development of innovative, high-quality products and supported with outstanding customer service in the sporting goods industry. Golf and recreational products are offered through Bag Boy, Burton, Datrek Golf, Devant Sport Towels, IGOTCHA, Riksha, SEARCH 'N RESCUE and FLAGPOLE-TO-GO brands, and include walking carts, golf bags, travel covers, custom sport towels, bag tags, golf ball retrievers, flags and accessories. Dynamic Brands' products are marketed in 87 countries worldwide. For more information, please visit www.dynamicbrands.com. Follow us at www.facebook.com/dynamicbrandsrva/ and www.linkedin.com/company/dynamic-brands/.